RUSH: I also got an email during the break. 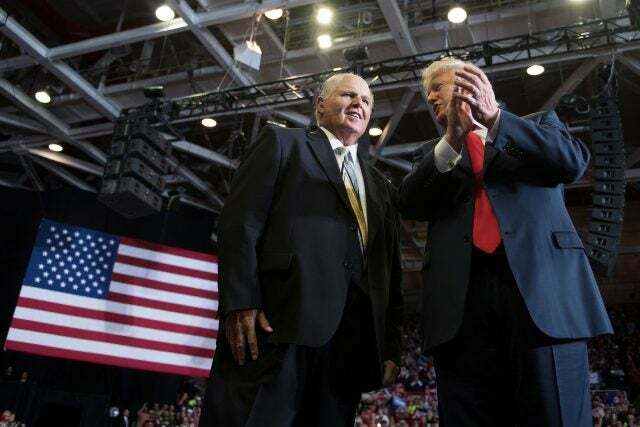 "Rush, Rush, what do you think of this George Conway situation?" Folks, this is so unseemly to me that I don't quite know what to think about this. So much of this is inexplicable. I'll tell you, there's a theory going around. Dawn, tell me what you think of this theory. The theory in Never Trumpville, the Never Trumpers think -- because people don’t understand. Here you've got a married couple, Kellyanne Conway works for Trump, you've got her husband, who's a lawyer and a professor and whatever. He spends every waking moment attacking his wife's boss. And the latest is he's tweeted out a couple of definitions of some pathologies, some psychological disorders, claiming that Trump has narcissist deflection personality and some other crazy thing. His wife is one of the key communications employees for the president of the United States, and this guy's out there attempting to sabotage and undermine his wife's boss. Now, the Never Trumpers are looking at this, and they're saying, “This doesn't compute. There's no way this marriage can continue unless something that we don't know is going on.” This is not Carville and Matalin. They were not undermining each other. Not like Conway is undermining his own wife. And she doesn't reply to it. You know, Mary, they'd get back and forth, you know, with Serpent Head and so forth in a friendly, humorous, sometimes cutting way. But it wasn't anything like this. This is not Carville and Matalin -- I'm sorry -- Matalin and Carville. Now, in Never Trumpville, the theory is -- are you ready for this? 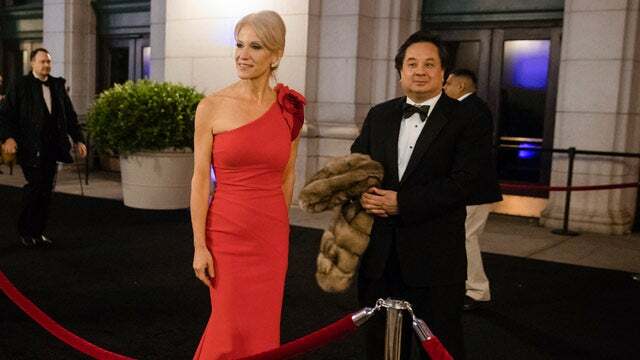 Three, two, one -- that George Conway is only doing this because Kellyanne wants him to. That Kellyanne thinks Trump is crazy but can't say it because she works for him, and so she is using her -- this is what the Never Trumpers believe. The Never Trumpers are out there thinking -- they look at this and they say there's no way that this marriage can continue. There's literally no way. Put yourself in this marriage and imagine your spouse undermining you publicly three to four times a week like this. And undermining your boss, who just happens to be the president. I mean, couples have gotten divorced for far less than this. But this marriage continues. So in Never Trumpville, they're telling themselves that this couldn't possibly be happening unless Kellyanne wanted it to happen. Really? If Kellyanne really thinks all of this crazy stuff that her husband is tweeting out there, she could quit. What do you think CNN would pay her to come on every day? They'd give her a three-hour block. They'd pay her $25 million for three hours to come on and explain all of this on a never-ending loop that they would run. She doesn't need to have her husband do this, is the point, if this is what she wants to do. 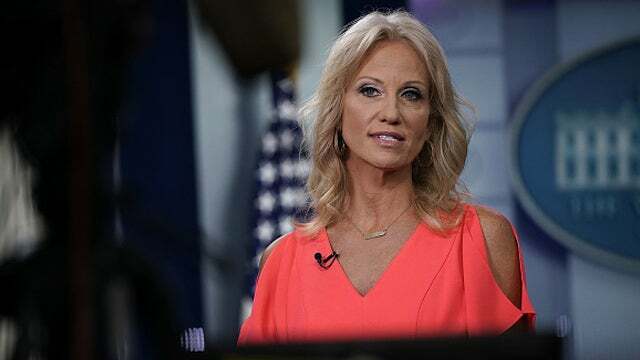 Plus, there aren't very many -- in fact, she may be, in the whole White House communication shop, she may the best consistent explainer, defender of Trump that he's got. And that would be a tough thing to fake. I'm just telling you, I don't know George Conway, I've never met him, and I didn't even know what he looked like until all this began. 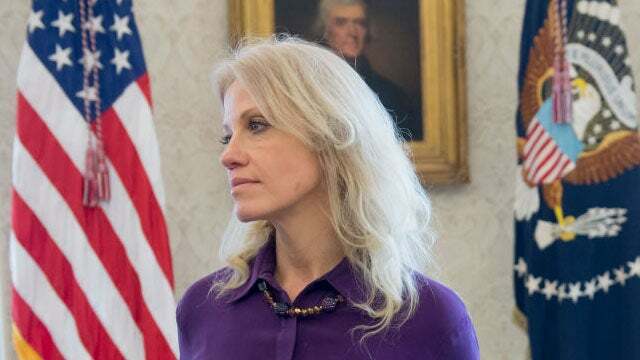 I know Kellyanne a little, but not well. But, as a husband, I cannot possibly relate to this. I can't imagine doing this. I can't even conceive, unless I was so angry and so consumed with bitterness over things that had nothing to do -- I cannot conceive of this. I think it is immature, it is silly, and now George is all excited 'cause Trump finally responded. Trump has been ignoring him for two years and Trump's finally responded. And George: Oh, wow, oh, wow, I finally got his attention. Now he's tweeting out even more psychological disorders, copying them and pasting them into tweets. I don't know how Kellyanne puts up with it. I've mentioned it to her. I saw her at the Trump rally in Cape Girardeau. She was there. And I tried to express, you know, a little sympathy, a little understanding. And she just laughed it off. "Oh, George is just silly. George, don't pay any attention that. George is just --"
I said, "Okay. Just trying to let you know here that I feel for you." "Ah, no big deal." And she just waved it off like George was one of her wayward children over whom she'd lost some control. Think of the book deal that she could get if the Never Trump theory of this is accurate. Anyway, you'll probably see that theory, if you haven't already, you'll probably see it bandied about throughout the Drive-By. Because if CNN gets hold of this, and they probably will now, they will just go bonkers with it. RUSH: We've got Kate in Carson City, Nevada. This is the old Kate from Fairfield, California, back from my Sacramento days. You're back at it. As always, it's great to have you here. CALLER: -- defender in the press. CALLER: I think he's jealous! RUSH: No, no. Personally. If... I am so proud of Kathryn for what she has done with the heavy lifting on the Rush Revere books and the redesign of RushLimbaugh.com. My wife, the more she succeeds, the prouder I am. I can't understand being that insecure and being jealous. Why can't he marvel in it, revel in it, and be part of it and help her along with this? I don't understand it, either. Now, Mr. Snerdley told me that you were glad I finally brought this up. RUSH: Here's the problem. See, I have to be very careful about what I bring up. I didn't want to bring it up today. I didn't want to give this guy any more amplification than he's already got. When I talk about something, the world hears about it eventually, and I don't know if this guy's worth it. But it got to a breaking point today. Some of this stuff is just so over the top, and it is inexplicable. It doesn't make any sense. CALLER: No, it doesn't, except you know what I think? I think the things that George Conway is saying about Donald Trump are actually true about George Conway. You know how sometimes you'll say something about someone else that's really the truth about you? RUSH: A-ha! A-ha! Now we're getting somewhere! RUSH: Well, sadly, sadly I'm out of precious broadcast time, but you nailed it. I mean, there's nobody that has any doubt what you mean (lauging) or what you're thinking about this. I'm glad you called. I always am. RUSH: Here is Todd in St. Cloud, Minnesota. You're next. It's great to have you with us. Hi. CALLER: Exactly. What disease do they have that that's what they do full time? That they get up in the morning, they hate and they spew hate and they gotta go get him. I'm not a psychiatrist, but, you know, I don't know if it's obsessive-compulsive disorder or it's somebody got in my Wheaties this morning. RUSH: Actually, it's a great question. While all these people are accusing Trump of massive psychological and pathological disorders, how about the Never Trump brigades, both our Never Trumpers and the Democrats, because we're dealing with clear irrationality at best. The best case we can make for them is they're irrational. CALLER: And Never Trumpers, the former Senator McCain was part of it, and I think we can all agree what President Trump had said, it hurt him, it hurt McCain, and it was disrespectful for McCain's service, but I think we can all agree that Senator McCain was the most conservative Democrat in the Senate. RUSH: (McCain impression) “Hey. I caught that. You can't get away with disparaging me, a conservative Democrat, I heard that, and you can't say it, you can't say it, okay?” Very clever on your part, sir. The most conservative Democrat that we had. You put that way, you do have a point. CALLER: I mean, you look at his history and all that. But, yeah, you listen to these people and, you know, that cable TV news station that has less audience than you have? I mean, I listen to 'em, I look at it, I want to get a perspective from all sides. And it's just visceral, their hatred for the president. Just think if 44 received half of the hate news media coverage that President Trump has received. RUSH: How would he deal with it? How would Obama deal? Let me remind everybody of something. Let me remind everybody. In one of Obama's early press conferences, Maureen Dowd asked him something about his ears, and he glared at her, he glowered at her, gave some answer. When it was over, he sought her out afterwards and told her he was very sensitive about questions about his ears. And she said (paraphrasing), “Don't worry about it, we're just trying to toughen you up.” Remember that, Snerdley? “We're just trying to toughen you up.” I guarantee, if Obama got one day of what Trump got, he would have sic’d Michelle on these people and who knows what would have happened then. He was telling Republicans not to listen to me! "That's not how things get done in Washington." That's another great point. The irrationality and the pathological disorders of all these people in the Drive-By Media about Trump is beyond describing, the irrationality of hatred. I can explain it, by the way. It would take me a while, but I can explain it, 'cause I understand their psychology. Trump wasn't supposed to win, and he did. They were supposed to make sure he lost, and they didn't. Trump is an outsider. He's not an elite and they are. Trump upsets the natural order of their daily existence. It's a total equilibrium disrupter, and they can't stomach this happened, particularly when their job was to make sure it didn't happen. They can't believe Hillary lost even though they know she was a rotten candidate. They don't like Trump's hair, they don't like the way he talks. It's a never-ending list of things. But it is real hatred. And real hatred is a poison. And they have been poisoning themselves daily, ever since Trump got into the race. OBAMA: You talked about my ears, and I just want to put you on notice. I'm very sensitive about -- what I told them was, I was teased relentlessly when I was a kid about my big ears. DOWD: We're just trying to toughen you up. RUSH: Were you able to hear that? See, I can't. I just heard what I thought were camera shutters and stuff. I couldn't hear a single word of that except for here: "We're just trying to toughen you up." So he said, "You talked about my ears, and I just want to put you on notice. I’m very sensitive about -- what I told 'em was, I was teased relentlessly when I was a kid about my big ears." "We just trying to toughen you up." Think about Donald Trump and orange hair! Yeah, our caller was right. These people are basically a bunch of babies. And they couldn't handle -- there's not a one -- Jim Acosta can't handle five minutes of what Trump gets. Obama couldn't handle a day of it.